Jerry Manock’s Burlington office is crammed with industrial-design jobs that never saw the light of day: a hockey skate with an adjustable blade; a “Cubic” furniture building block that IKEA almost bought; and a model for the “rumbler,” a bathroom-scale-like device designed to vibrate at a frequency to maintain elder bone density. Any number of factors — timing, money, patent problems — can kill a great invention. But Manock got at least one product right. In 1977, when he was 33 and Apple had just five employees, Steve Jobs hired him as a consultant to design the Apple II, one of the first personal computers in history to be successfully mass produced and marketed. Manock gets credit for almost everything but the circuit board and the logic (which was engineered by Jobs’ partner and Apple cofounder Steve Wozniak): the machine’s “thermal management, the structure, the outside aesthetics, the color — beige, Pantone 453, the color of the deep-space universe,” Manock says, rattling off his contributions to the once-cutting-edge Apple II, which now looks like a yellowing typewriter on a shelf in his office. Beside it sits the smaller, self-contained, revolutionary Macintosh. A successor to the Apple II, it was the first personal computer to incorporate both a graphical interface and a mouse in a way that inspired the term “user-friendly.” Manock was part of the original team of a half-dozen workers who designed the Mac. Both man and machine are Apple originals. Manock says the deal was for $1800, and has a letter signed by Jobs to prove it. Such positive reactions were rare. As Isaacson documents, Jobs was an unapologetic critic of every step of the product-development process, from hardware functionality to the experience of opening the box. But he was satisfied enough with Manock’s work on the Apple II — and subsequent Disk II — to hire him full time as corporate manager of product design. In fact, Jobs was just getting started. Apple went on to develop the iPod, iBook, iPhone and iPad. Last week, Apple briefly overtook Exxon as the most valuable corporation in the U.S. From his unique vantage point, Manock had a clear view of a visionary entrepreneur who employed what colleagues describe as a “reality distortion field” to charm, inspire and drive his employees to do the impossible. Manock lists Jobs among the top five most influential people in the world, along with Gandhi and Jesus Christ. You could say Manock, now 66, is an Apple apostle. The sole proprietor of Manock Comprehensive Design has mastered no shortage of design challenges, and for 21 years has taught a University of Vermont class on integrated product development. Art and engineering — and marketing — are compatible in Manock’s world. His wife, Mary Ellen, and two daughters, Abby and Katherine, are all artists. Abby borrowed her dad’s copy of Steve Jobs before Manock had a chance to do much more than check the index, confirm he was in it and determine Jobs hadn’t described him as a bozo. On a recent trip to Maine with her parents, “Abby read it all the way over and all the way back, and would all of a sudden start cracking up,” Manock says. “Then she’d ask me about those parts of it I was involved in. I loved her interest in it. And it is sort of part of her heritage, too.” The Manocks still have the teddy bear Jobs gave Abby on the occasion of her birth, almost 35 years ago. 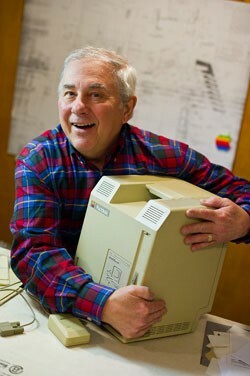 These days, Jerry Manock is busy readying all his other historic Apple paraphernalia — blueprints, business plans, confidential memos, color chips, hardware, project notebooks — to ship to the Silicon Valley archive at Stanford University, where he earned a bachelor’s and master’s in mechanical engineering with a graduate focus on product design. Not included in the shipment: Manock’s memories of working alongside a future legend, and their brief encounters after he moved his family to Vermont in 1985. That conversation — pieced together from talks at his Burlington home and office — is excerpted below. There were about five people in the company when he called me to come up to the Homebrew Computer Club at Stanford Linear Accelerator [Center] to talk to him about the design of the Apple II. What totally stands out: I came up to a group of maybe four people that he was already talking to, who were kind of circled around him… He’d just work his way around the circle, and when he’d come back to me, he’d pick up exactly where he left off. And I thought, Oh, my God. That really impressed me. He had a very quick mind and was very savvy about what was going on. What I heard later is they had asked a lot of other designers in Silicon Valley if they could meet this very tight schedule — this was November or December of ’76 and they wanted to have multiple Apple IIs at the West Coast Computer Faire in April of ’77. I think a lot of other people, other designers, turned him down and said that’s totally impossible. I didn’t have that experience, so I said, “I’ll give it a try” and quickly started building models. I only met Steve’s dad once. Wozniak, Jobs and myself had spread my Apple II drawings on the living room floor at Jobs’ house. He came home from work, with his lunch box, and kind of stepped around us with a look on his face like, “What the hell is this?” Never said a word. Steve would say things like: “I was just thinking, in my career I could be the CEO of two or three billion-dollar companies.” Apple had just started out, and there was no inkling of NeXT or Pixar. Walking back from lunch one day, I said, Steve, you paid me $1800 for the Apple II, and it’s getting to be more and more popular, and I really think I ought to have a royalty on that. I ought to get, like, a dollar a unit, because $1800 wasn’t all that much. He never hesitated. He looked at me and said, “You’re very good. But if you knew how many we thought we were going to sell in the next two or three years … You’re not that good.” What do you say to that? He was absolutely right. How many millions of those things did they sell? You can’t ask for royalties after you’ve delivered the work, so it was totally stupid and naïve on my part. And he was a really incredible negotiator. I had just stopped working for a big company. I wanted to be on my own, set my own schedule. Then, like, 75 percent of my billing was to Apple. So I said, “Look, this is crazy. I’ll join you, but I only want to work half time. Twenty hours a week. Well, I wound up working, like, 50 hours a week, for half pay. I did that for about six months. I thought, This is totally stupid. When I signed the papers as a full-time employee, I was No. 246. I always tell people I could have been No. 6, which was worth, like, $85 million when they went public. But instead, I wanted my $20-an-hour consulting fee. 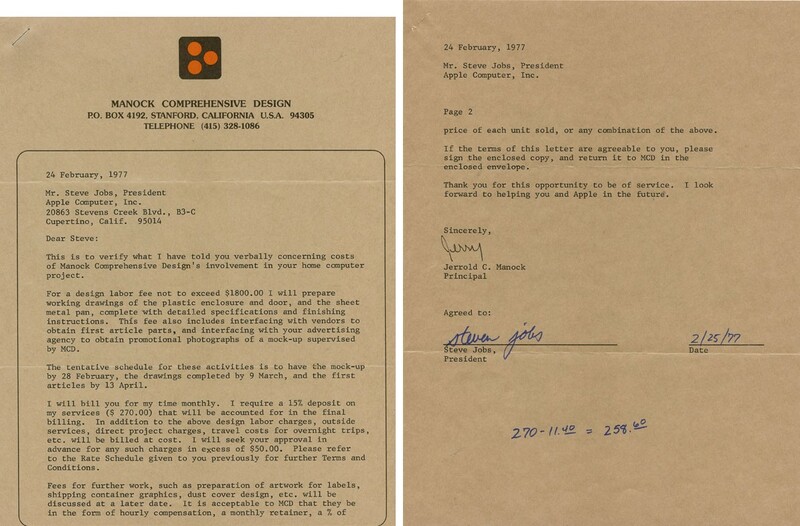 Jerry Manock's original deal with Steve Jobs. Click the image to see it at full size. We still have Apple stock, but it’s not the original. The basis of that stock went from 3 cents a share to $65 a share when it went public. You can imagine some of those tech guys in the lab, with just a high school education, were given maybe a thousand shares of stock when they joined. These kids were all of a sudden worth millions of dollars. The IRS said, if you exercise the option, it’s just like earned income. You have to pay taxes on it. All of a sudden these guys were getting tax bills from the IRS for, like, $185,000. They didn’t know what to do … I wrote to the IRS and said, “I’ll try to pay you quarterly.” They wrote back and said, “Pay it all now or go to jail.” This was serious stuff. But we were lucky. Steve was a really good motivator — of groups. He wasn’t necessarily good one-on-one. He wanted to see what was going on, so he’d come up behind with no warning and say, “What’s that piece of crap?” I’d start trying to explain, “Well, I had to take this into account and also this...” and get all tongue-tied. He’d just get disgusted and walk away. A lot of people took that as a negative criticism of what was being done, and then they would change it, and then they’d get fired. Steve invited 10,000 of his closest friends to the Apple III kickoff party — at Disneyland — and the computer started having intermittent problems. It would black out and come back on. Everybody was blaming it on my thermal management. Finally we realized it was the circuit board. It was the last one that Apple laid out by hand before the computer made sure the lines were straight. Steve called me into his office one day, and I was expecting to get fired because of all these Apple III problems. Instead of that, he said, “This was a big problem, and I’m really unhappy about it, but I’m not going to fire you. I want you to join Jef Raskin on his Macintosh team.” That was the closest I ever came to getting fired. Jobs wasn’t in favor of focus groups, which were very popular at that time. He’d say: They’re going to base their knowledge on what exists now. I know what is going to exist five years from now, and they’re not going to understand that. His genius was in synthesizing different technologies and putting them together to solve a problem that you didn’t know you had — a couple of years out. Apparently, before he died, he laid out four to five years of product-succession plans. Steve’s probably directly responsible for the experience of opening the box. The first thing you’d see was a plastic box that said, “Open me first.” Graphic pictures showed you how to set it down on the desk, take this end of the cord and plug it in. Then the computer was programmed to come on and smile at you and lead you on to the next step. It was all part of the design of the product. Packaged experience. That’s concurrent engineering. You don’t have responsibility for just one part of the product. That was Steve’s vision. I have a sweatshirt upstairs that says, “90 hours a week and loving it.” At the end of the Mac project, when we were under pressure to release it, [Mac team colleague] Burrell Smith came to a party and he had crossed out the 9 with masking tape, so it said “0 hours a week and loving it.” The long hours were mitigated to some extent by Steve being very generous with bonuses. I also have an Apple Hero medal. People were recognized for contributions. He was very good at doing that. A lot of the people at the end of the Macintosh project had really serious problems. The engineering manager, between the stress of getting that project out and the Scully-Jobs battle, was called into the executive conference room and asked, “Who do you support?” He said, “Well, I work for the Macintosh division, and Steve is my division manager, so I support him.” And so they said, “Well, you’re fired.” Just like that. He got in his truck — he was married with two daughters — and just disappeared. Wozniak’s big claim to fame is, he could take an integrated circuit that was meant to do one thing and he would hook it up differently so it did three things. Unless you’ve burned your fingers on the soldering iron, you don’t know if that’ll work. I’ve always been an advocate of hands-on learning. I had shop courses in junior high. I had metal shop, printing shop, electric shop and wood shop. And in high school, too. I was learning how to screw things together, or apart. How things worked. I don’t think that’s happening anymore. Nowadays you can design something in 3D, have photorealistic rendering, cast shadows and specify, “This is metal. This is wood.” You can come up with a picture of it without ever touching a physical thing, without ever building a model to hold in your hand. To me, that’s really dangerous. I get really upset when I’m walking downtown and there are three young people walking toward me — all with their heads down. I try to make eye contact to say hello, good morning, and nothing. The disconnect there bothers me, and that’s going to get nothing but worse. I’ve got my iPhone and GPS and news anytime I want it. But my mindset is: I’m not married to this thing. I don’t have to look at it every five minutes. I can kind of use the technology for what I need. I feel pretty balanced that way. And I’ve made a conscious decision not to go with all the social-media stuff, because it takes up too much of my time. I can’t read a book. I can’t sketch. I can’t go to movies if I’m constantly tweeting somebody. Mary Ellen and I went to California — it must have been 10 years ago. We went to the annual meeting, unannounced, and sat in the fourth row. The executive staff came onstage and they sat on their little stools, going through their business. Steve looked over at us and he did a double take. I thought, Well, that’s really nice. He recognized us. At the end of the meeting, when they asked if there was any more business, Steve said, “I have some business.” He said, “I just want to acknowledge Jerry Manock.” And he told of our contribution, being on the Macintosh team. Everybody stood up. It was a standing ovation. He didn’t have to do that. To me, basically, [Steve] was a compassionate person, who had super high expectations and tried to get the best out of everybody. He had a vision that we certainly didn’t have… People took the creativity it gave them and added their own, and made it fit, which is really rewarding. I was really happy to see the picture on the back of the book, with the original Macintosh on it. That’s how I remember Steve.